Russ Linden is a management educator who specializes in organizational change methods. Since 1980, he has helped government, non-profit and private-sector organizations develop leadership, foster innovation, and improve organizational performance. He is an adjunct faculty member at the University of Virginia, University of Maryland, and the Federal Executive Institute. He writes a column on management innovations for The Virginia Review, where he serves as Contributing Management Editor, and has produced national videoconferences on re-engineering and on the human side of change. In 2002 Russ was named the Williams Distinguished Visiting Scholar at the State University of New York (Fredonia), for Spring, 2003. Russ has studied innovative organizations in Japan and the U.S. His current teaching and consulting interests include the human side of change, learning organization principles, reengineering for seamless service, customer-focused organizations, and collaboration across organizational boundaries. He has published numerous articles, and his first book, From Vision to Reality: Strategies of Successful Innovators in Government, came out in 1990. 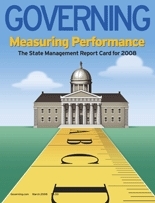 His next book, Seamless Government: A Practical Guide to Re-engineering in the Public Sector (Jossey-Bass, 1994), was excerpted in the May, 1995 issue of Governing Magazine. In 2002 it was translated into Chinese. His most recent book is Workbook for Seamless Government: A Hands-On Guide to Implementing Organizational Change. It was published by Jossey-Bass in 1998. His next book, Working Across Boundaries: Making Collaboration Work in Government and Nonprofit Organizations, was published by Jossey-Bass November 2002. His clients have included the National Geographic Society, Departments of the Navy and Army, Health Data Services, Inc., U.S. Customs Service, U.S. Dept. of State, Metro Information Services, Inc., Government of the Cayman Islands, U.S. Information Agency, U.S. Dept. of Treasury and of Education, two state attorneys general and over four dozen state, local government, and non-profit agencies. He has also worked with a number of schools, departments, deans and vice presidents at the University of Virginia and other state universities. Some local governments are redesigning their organizations using the principles in his book, Seamless Government. Before beginning his full-time practice, Russ was a Senior Faculty Member at the Federal Executive Institute. He served as the Director of Executive Programs at the University of Virginia’s Center for Public Service, taught at the UVa McIntire School of Commerce, and taught and managed in the human services field for 10 years. Russ Linden’s bachelor’s and master’s degrees are from the University of Michigan. His Ph.D. is from the University of Virginia. His major volunteer activities involve programs that help low-income youth succeed in school and go on to college.